The combustion process when wood is burned is never complete. The smoke from a wood fire usually contains a dark brown or black substance which has an unpleasant odor. This tar-like substance is called creosote and is found almost anywhere in a wood heating system. At temperatures below 250 degrees F creosote will condense on the surfaces of stove pipes or chimney flues. When the temperature gets below 150 degrees F the creosote deposit will be thick, sticky and similar to tar. This tends to trap carbon from smoke which dries and bakes inside pipes and flues. This flaky substance is very flammable. Creosote is more of a problem with wood stoves than fireplaces since the exhaust gases from stoves are cooler than those from the fireplaces. The amount of creosote condensing on the surfaces of the system varies according to the density of the smoke and vapor from the fire (less smoke means less creosote), the temperature of the surface on which it is condensing (higher temperatures reduce chance of creosote condensation) and the type and dryness of wood being burned. (Photo of Creosote) Creosote may build up to a considerable thickness on the interior surface of the chimney and the draft opening may subsequently be reduced. A serious fire may be ignited if creosote is allowed to build up. Most problems with creosote are due to poor chimneys with a low draft and cold walls. You can reduce the creosote problem several ways. Smoke density can be lowered somewhat in an airtight stove by using small amounts of wood and stoking more often or by using larger pieces of wood. Creosote formation can be limited by leaving the air inlet or stove door slightly open after adding wood to promote more rapid burning until the wood is mostly reduced to charcoal. Then close the inlet as desired once new fuel is combusting. Allowing this extra air causes more complete combustion lowers the potential creosote-forming gases and generates additional heat to the surrounding area. Vapor in the flue gases may be controlled by using the driest wood possible and using only small pieces of wood during mild weather when combustion is relatively slow. The stack temperature can be raised by insulating the stove pipe connection so that it cools as little as possible before reaching the chimney. Using an insulated pipe also aids in increasing the stack temperature. Draft can be increased by having as few bends as possible between the appliance and the chimney, having the proper height and diameter, keeping the chimney in good repair and by having a separate flue for each appliance. Also use proper sized stove pipe. In a large chimney, draft can be increased by decreasing the flue size. This can be done by installing a new smaller flue or a stainless steel stove pipe liner. In many airtight stoves, a sealed overnight fire will deposit creosote even with dry hardwood. To dry the creosote always open the draft caps and let the fire burn hot for at least 10 minutes every morning and again before bedtime. Opening the direct draft damper 20 to 30 minutes to dry the creosote in chimneys is a questionable practice. This should only be done in a new or clean chimney and should be done daily or every time you use the wood stove. Allowing hot flame in the chimney at intermittent times can result in a small chimney fire. The heat generated from these hot flames also may cause deterioration of the metal or crack mortar in the chimneys. No wood burning system is 100% safe and fire-proof. A safe installation and extra care help prevent fire, but accept the idea that there could be a fire, and be prepared to handle it. Chimney fires are most likely to occur during a very hot fire, as when cardboard or Christmas tree branches are burned or even when a stove burns normal wood but at a higher than normal rate. Make certain everyone in the house is familiar with the warning signs of a chimney fire --- sucking sounds, a loud roar and shaking pipes. Instruct everyone on what to do in case of fire. Practice fire drills and instruct all adults on how and when to use a fire extinguisher. Put the fire department phone number in an obvious place near the phone. a) Call the fire department immediately. b) If all the stove pipe joints are tight and no other appliance is connected to the same flue, close all openings and draft controls if you have an air-tight stove. Close the stove pipe damper in a non-air-tight stove. c) You can attempt to cut off the air supply to a fireplace by using a wet blanket or sheet metal to seal off the fireplace opening. Be careful since a strong draft can make this difficult and dangerous. Use only non combustible materials. d) If you have a leaky stove or fireplace you may have to wait for the fire to burn out. e) Get everyone out of the house, and put them to work watching for sparks or signs of fire on the roof or nearby. One adult should stay in the house to check the attic and upper floors for signs of fire. f) Discharge a class ABC dry chemical fire extinguisher or throw baking soda into the stove or fireplace if the chimney is not sound or there is a danger of the house or surroundings catching on fire. The chemical travels up the chimney and often extinguishes the flame. g) Throwing water in a stove will cause the metal to warp, but if it's a choice between the house or the stove, use water. h) Check the chimney after a fire. A chimney fire can range from 2000 to 3000 degrees F which is hot enough to cause deterioration of metal or cause masonry to weaken. Metal chimneys can deteriorate after 2 or 3 fires. i) If a chimney fire occurs once, chances are that it will occur again. Find the cause. A problem with frequent chimney fires is the possibility of the framing catching on fire. The ignition temperature of new house framing is about 500 degrees F. Over a period of years, as this wood is repeatedly heated by chimney fires, the wood will ignite at a much lower temperature. Chimneys need to be cleaned to remove creosote and soot deposits. This will prevent chimney fires and improve the draft as well. How often the chimney is cleaned depends on how frequently the wood burning appliance is used, how it is operated and the type of installation. Some authorities recommend cleaning the chimney after every third cord of wood is burned and most recommend at least once a year. 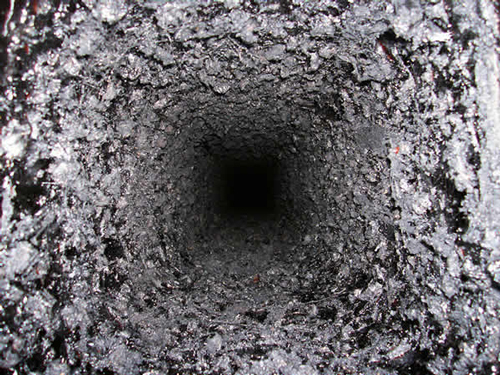 Any time you observe excessive soot and creosote, the chimney should be cleaned. After you once have cleaned the chimney, you may want to check it after 2 weeks, 1 month, 2 months, etc., to determine how often your chimney needs to be cleaned. You may have the chimney cleaned for you by professional chimney sweeps or you can clean it yourself. Costs for chimney sweeps vary with the job but usually amount to about $60. ln addition to cleaning your chimney, a good chimney sweep can act as a inspector for your installation. Chimneys are normally cleaned by mechanical means to scrape off any loose creosote build-up. Stiff wire chimney cleaning brushes are available at reasonable cost. They are constructed to match the size of the chimney flue and can be pushed through the chimney with extension rods or pipe or can be pulled with ropes on either end of the brush. You can attach a weight to the bottom of some brushes. The weight will drag the brush to the bottom of the chimney so it can be pulled up with a rope. Many people start chimney fires deliberately by building hot fires or by tossing in compounds designed to remove soot and creosote by controlled burns. Under some circumstances this practice may be reasonable, but generally it is a risky way to keep a chimney clean. Any chimney fire could build into a house fire, but in addition a chimney fire causes wear on a chimney. The high temperatures increase corrosion rate of metals and cause thermal expansion of masonry materials which can lead to cracks. Some of the compounds used in controlled burns have been known to explode in stoves. Chemical chimney cleaners are commercially available. These are not intended for use in chimneys already containing heavy deposits of soot and creosote. Chemicals such as sodium chloride, or table salt, are sometimes used as a chimney cleaner. These chemicals combine with water released from a hot fire to form a weak acid that dissolves small amounts of creosote. Sodium chloride is corrosive to metal and is not recommended for use. Chemical cleaners are intended to be used after chimneys are cleaned or new. Use the chemicals as directed--- approximately 50g per week. If not used as directed, the chemicals can cause intense chimney fires that will result in rapid deterioration of the chimney. THE ONLY EFFICIENT AND EFFECTIVE METHOD OF CLEANING IS TO USE A CHIMNEY BRUSH, SINCE THE BRUSH SCRUBS THE ENTIRE SURFACE UNIFORMLY. Before starting to clean the chimney, be sure all doors and windows are shut to prevent any drafts. Remove damper, if possible. Seal fireplace opening with a drop cloth and masking tape. You will need proper protective clothing, including a mask to cover your mouth and nose and glasses or goggles for your eyes. The material that collects in chimneys is of such a nature that you should avoid contact with it as much as possible. Wear good shoes with slip resistant soles and be careful when climbing on high, steep roofs to clean a chimney. When cleaning the chimney from the roof, the easiest method is to attach a line to the brush with a weight on the opposite end. This weight should be of such a size and shape that it cannot swing free into the tile liners and cause damage. The purpose of the weight is to pull the brush down into the chimney. A solid 5 kg- to 10 kg weight is required to move the brush downward. This will depend on how tightly the brush fits and how dirty the chimney is. Another method is to attach a rope at each end of the brush with a person at the top of the chimney and one at the bottom, taking turns pulling the rope. This method may be somewhat messy. More effective is the use of rigid extensions such as a pipe or tubing with a flexible leader. This allows you to control and feel the scrubbing action of the brush in the chimney. This method is used by most professional chimney sweeps. Fiberglass rods are available for this purpose. If metal pipe is used, be careful of power lines above. Lower the brush into the chimney being careful not to disturb any loose brick mortar or any device in the chimney. Cleaning can be accomplished by passing the brush through the chimney a number of times in the same direction or by raising and lowering the brush in short strokes in a scrubbing action. If your brush is too large, it will not reverse in the chimney and may even lock up. Experience will tell you how many passes to make to get the chimney clean. Once this process is finished, remove the seal from the fireplace opening. Use a drop cloth in your working area. Slowly open the damper if you were unable to remove it, vacuum up debris from the bottom of the hearth, smoke shelf or catch pit. If you can't open the damper you may have to drop a hose down the chimney to vacuum out the soot. While cleaning masonry chimneys, check for cracks in the brick or masonry. Cracks allow cool air to come in, thus reducing the efficiency of the fireplace or wood stove and allowing creosote to form. Stove pipes on the wood burner are critical to safety and require additional attention. When cleaning an inside flue, remove the connected sections. Be careful to protect the area from soot. Take the sections outdoors and brush inside them with a hand wire brush or a flue or chimney brush that is the same diameter as the pipe. Remove all the soot and creosote build-up from the breech and the loose accumulation in the fire box. Stove pipes need to be cleaned regularly. Check pipes at least once every 2 or 3 months of stove operation. After using your chimney brush, rinse it in a cleaning solution such as kerosene and store it away in a dry place. lt is a valuable tool.